This week’s TWD was chosen by Carol of mix, mix…stir, stir: perfect party cake! I’d actually made this cake last year for my grandmother’s birthday and we all loved it! I decided to scale the recipe down and make cupcakes this time as I really didn’t have an occasion for a giant layer cake and didn’t need all that temptation hanging around. I made 1/4 of the recipe, which yielded 5 cupcakes. They baked up beautifully in about 18 minutes. When I made the cake last year I’d tried Dorie’s whipped cream frosting recipe instead of the buttercream called for in the perfect party cake. I’m sure the buttercream is fantastic (how could it not be with 3 sticks of butter?) but I actually prefer a whipped cream frosting. Besides, I’d convinced myself the heavy cream in the whipped cream was healthier than the 3 sticks of butter in the buttercream (I’ve never actually compared the nutritional data on the two – I’m afraid of what I’d find). This time I went with a whipped cream frosting again but tried a lemon whipped cream playing off of the lemon flavoring in the cake. Dorie’s cake is just as fantastic as I remember it! It’s very light and I love the nice tight crumb on the cake. The lemon whipped cream worked perfectly with the lemon flavor in the cake. The whipped cream has just the slightest hint of tartness from the lemon zest and juice but it’s well balanced by the touch of sweetness from the sugar. I will definitely make both the cake and this whipped cream again! You can find the recipe for Dorie’s perfect party cake on Carol’s blog. Even if you’re not going to try the cake, you should visit Carol’s site and check out her gorgeous photography! If you’d like to see the other cakes this week visit the TWD site. Combine all ingredients in a bowl and, using an electric mixer, beat to soft peaks. The whipped cream can be made up to 4 hours ahead. Cover and chill and rewhisk before using. 40 Responses to "TWD: Perfect Party (Cup)Cake!" What a nice take on this recipe! The cupcakes are lovely. Thanks for baking with me this week. Aha! We did the same thing! We both made cupcakes! Bravo on yours, they look fantastic! Cupcakes were a great idea! They look so pretty, too. Well done! These look gorgeous. I love the little lemon wedge on top. I bet these were great with the whipped cream frosting. Whipped cream is one of my favourites too! At least it’s 35% while butter is 80% fat! Sounds fab. I also made cupcakes instead, and the lemon whipped cream frosting sounds perfect. I couldn’t bring myself to make that buttercream this week! It is really all about the cake and not the icing. She said Perfect Party Cake, not Perfect Party Cake and Icing, right? I am so going there with cupcakes and this recipe next time I make cupcakes, I just loved the lemon and vanilla combination in the cake batter. I made half a recipe, but oh, darn, the whole amount of lemon zest “accidentally” went into it. LOL. Yum…no such thing as too much lemon! Your cupcakes look elegantly beautiful and delicious. Any left? Oh, and btw, the reason there are usually eaters on the TWD posts is that my friend CC says in order to believe that people are actually able to EAT my baking, there must be proof! It’s a running joke with us each week. CC remembers the days when I was in high school and couldn’t cook or bake a thing. Beautiful cupcakes! I am definitely trying the whipped cream frosting next time I make these (or any cake, for that matter). I feel like whipped cream frosting is what I’ve been missing all my life. I went for whipped cream, too. So good. I love the lemon wedges on top. Looks perfect. Cute cupcakes! I so want to try this recipe now. These cupcakes are adorable! I love the idea of the lemon whipped cream. I’m going to have to try this recipe again and cupcakes sound like the way to go. Beautiful! The lemon whipped cream sounds divine, and I agree about not wanting to look at the nutritional facts for buttercream or whipped cream icing – I just want to enjoy my cake. Tracey, those cupcakes are so pretty! 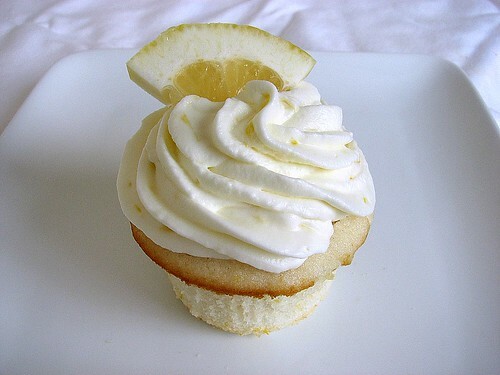 I love the lemon slices in the frosting, it looks so elegant. And, lemon whipped cream frosting sounds delicious. Wow, with all that lemon these would be perfect for summer! And so beautiful. Now I want some cake!! or better yet, a cupcake. So cute! And the lemon whipped cream sounds absolutely delicious. Bookmarking that recipe. Thanks! I need to work on my math skills because quartering some recipes would be so wise for portion control! The cupcakes are lovely, and I LOVE the lemon slice on top. I’ve finally had a slice of cake, and I’m off to have another in a few minutes. The cake was great! I loved the way the flavors came together. Just as good as any bakery cake I’ve had, that’s for sure!! I lOVe lemon and your cake looks so good! Love the sound of the lemon whipped cream on these beauties. Your cupcakes look lovely! And the lemon whipped cream sounds delcious–something I would definitely enjoy (love all things lemon). oh, tracey! these cupcakes are just so sweet! i’m sure they melt away on a lemoney cloud….yummm. I love them!!! They are so party perfect and dainty! I think I may use this for an upcoming baby shower. Amazing ! This Cupcake look so Tasty! Join, post your comments, share your recipe! Oh man… isn’t it crazy when heavy cream is the healthier alternative! Hahah but your cupcakes look gorgeous – I love the light and fluffy whipped cream topping! Your cupcakes look so creamy and dreamy and refreshing. Beautiful! This is indeed a great cake. I really like that you made it into cupcakes. They look super cute. Your cupcakes are gorgeous! I love the lemon on top. Great job. Isn’t this a great summer cake? I used more lemon zest because I didn’t have the extract and I really like lemons. Next time I make it, I’ll go the cupcake route and use them for strawberry shortcake with whipped cream. Mmmmmmm. This is now my go-to white cake batter. I can’t wait to try it as cupcakes. Yours look so beautiful! 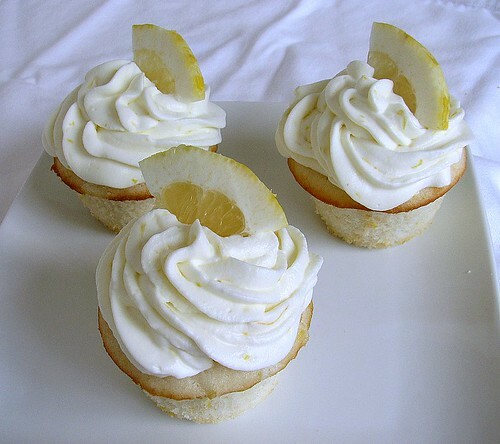 The lemon wedges are a great accent and I will have to try that whipped cream. They look wonderful. That is gorgeous! And I love the lemon whipped cream. I may have to try this one…. These look sooo good Tracey, nicely done. Oh how I wish I could have whipped cream! Lemon whipped cream? Sign me up – how perfect for those cupcakes! Lemon whipped cream! On a already perfect cupcake! Yumm!! !